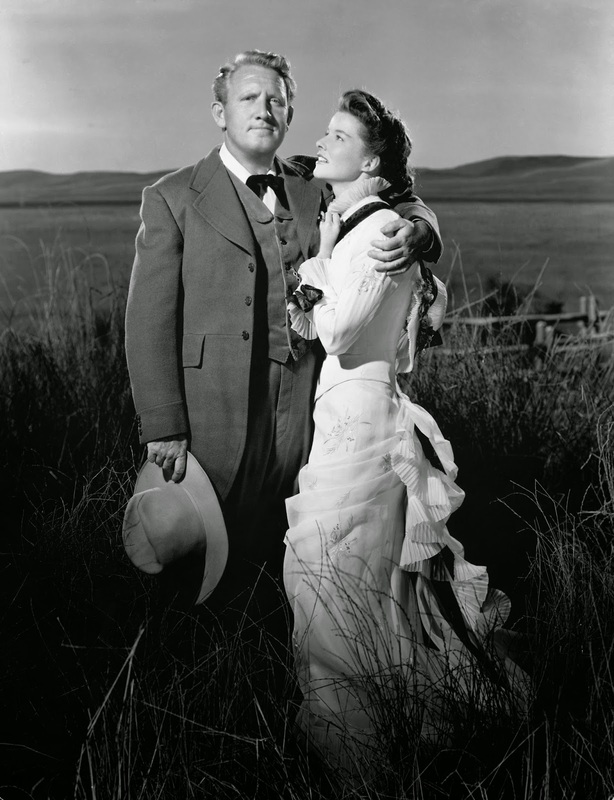 This week's Western is The Sea of Grass (1947) directed by Elia Kazan and starring Spencer Tracy and Katharine Hepburn. Elia Kazan dreamed of making an epic movie about the man-made destruction of the Great Plains, but his hopes were dashed by studio interference and clashes with his stars. The Sea of Grass is based on the 1936 novel by Pulitzer-Prize winning author Conrad Richter. The film tells the story of Lutie Cameron (Katharine Hepburn), a sophisticated St. Louis resident who travels to New Mexico to marry cattle baron Jim Brewton ( Spencer Tracy), who owns huge tracts of land on which he grazes his large herds. Brewton, who believes he is on a mission from God to save the Great Plains, uses harsh tactics to keep homesteaders from farming the land. Brice Chamberlain (Melvyn Douglas), a local lawyer and later a judge, bitterly opposes Brewton' methods. 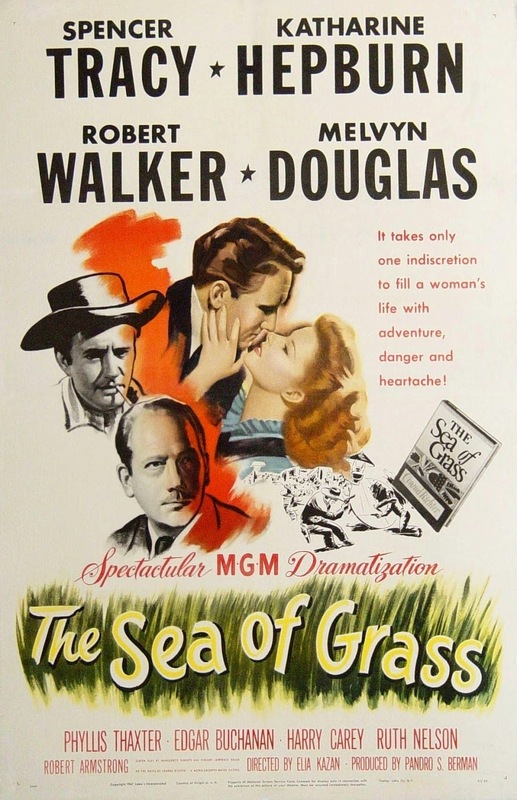 A vintage poster for The Sea of Grass (1947). Brewton alienates Lutie when he destroys the lives of a homesteading couple (James Bell and Ruth Nelson), who are her only friends in New Mexico. Lutie, who cannot understand her husband's obsession with the prairie, seeks comfort with the handsome Chamberlain. They have a brief affair, which results in a son (played as an adult by Robert Walker), who grows up to be a ne'er do well. Brice Chamberlain (Melvyn Douglas) and Lutie Brewton (Katharine Hepburn) have a doomed love affair in The Sea of Grass (1947). Kazan wanted to make The Sea of Grass entirely on location, but budget-conscious MGM executives forced him to shoot the film in the studio and to use stock footage and process shots, according to Kazan's autobiography. 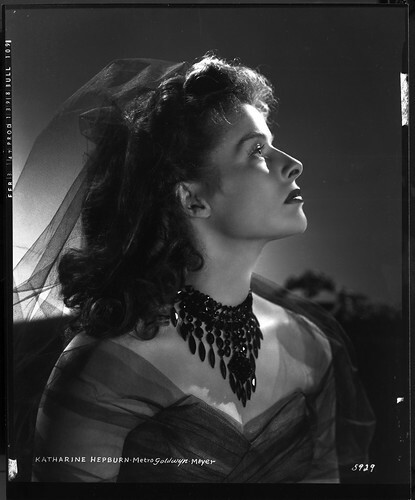 A beautiful portrait of Katharine Hepburn in one of her The Sea of Grass (1947) costumes. The studio imposed other restrictions on Kazan. MGM was known as the most glamorous of the old Hollywood studios, and studio chief Louis B. Mayer didn't want two of his prize stars looking like broken down sod busters. Hepburn' s wardrobe is quite glamorous for a rancher's wife; in fact, she looks stunningly beautiful in this film as you can see from the photos. Mayer kept a close eye on the novice director and didn't hesitate to call Kazan into his office for one of his legendary rants. "We make beautiful pictures about beautiful people," Mayer screamed at Kazan when he didn't like the way Hepburn was crying in one scene. Kazan was deeply disappointed in The Sea of Grass and he urged his friends not to see the finished film (Kazan would get another chance to make a Western with somewhat similar themes in East of Eden (1955), which we'll cover later in our series). (James Bell and Ruth Nelson) in The Sea of Grass (1947). Despite the film's many flaws -- the process shots look cheap, Tracy walks through his performance and Douglas is terrible at playing a heavy -- The Sea of Grass is a notable Western because it is one of the few films that covers life on the Great Plains. Many American literature classics are about life on the prairie (O Pioneers! by Willa Cather, Giants in the Earth by O.E. Rolvaag and Laura Ingalls Wilder's Little House series), but most old Hollywood Westerns focus on the cowboy myth at the expense of stories about family life in the West. There are exceptions to this rule of course: John Ford's masterpiece The Grapes of Wrath (1940) follows the Joad family as they escape from the Dust Bowl and even the twister scenes in The Wizard of Oz (1939) are reminiscent of the real-life dust clouds that blew across the prairie, although no Hollywood special effect could match the awesome power of the real dust clouds, shown below in the clip from Ken Burns' documentary The Dust Bowl. The Sea of Grass does not cover the Dust Bowl; instead, it occurs during the decades preceding the natural disasters of the 1930s. By the late 19th century, the large bison herds that roamed the Great Plains had been hunted to extinction and the Plains Indians had mostly been herded into reservations. Settlers from the Eastern United States and Europe flooded the West, bent on making a living by farming the fertile earth. So many people came and so much of the Plains were plowed over that it created one of the greatest man-made disasters in human history. In The Sea of Grass, Brewton wages a scorched earth campaign against the homesteaders, but in reality, there were few voices of warning before the Dust Bowl. So little was known about the Great Plains natural ecology, that no one realized what was happening. The Sea of Grass is available for streaming on Warner Archive Instant. It is also available on DVD and video on demand. For more in Top 100 Westerns series, go here. Next up, Laurel and Hardy go Way Out West (1937).